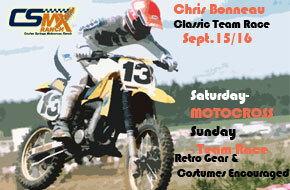 Come check out the Chris Bonneau Classic on Sept.15 and 16th. 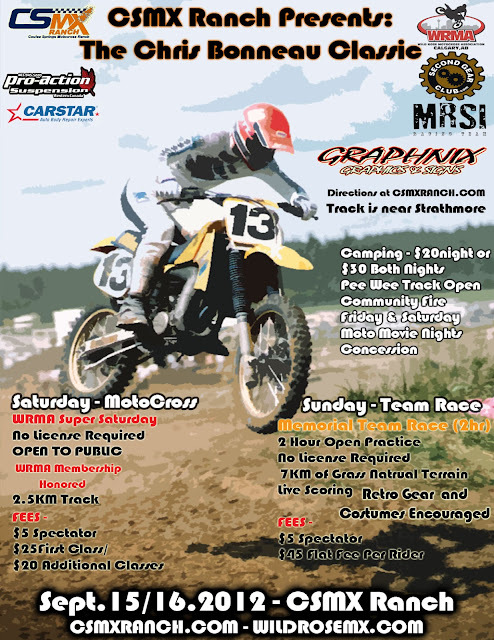 Saturday is the Wild Rose MX Super Saturday Round 2 Event!. Sunday is the Team Race for the Chris Bonneau Memorial Race! This is where we match a pro/intermediate with a Junior/novice rider and teams go head to head to see who can come out on top! This is a for fun event, we want fair teams, fun racing and some goofy costumes and retro gear to show off!. Friday & Saturday night we are going to have Moto Movie Nights, Showing 2 Moto Movies! Saturday Evening will have the showing of On Any Sunday, Chris Bonneaus Favorite movie! We also hope to have a community fire for all to enjoy and pit race around.